When it comes to pumping up your tires there are many options available but all it really comes down to is that you want a pump that fills your tire with air so you can get back on the road or trail. The JoeBlow Sport 2 does just that – and it does it with some consistency and quickly so long as you can get it to seat. 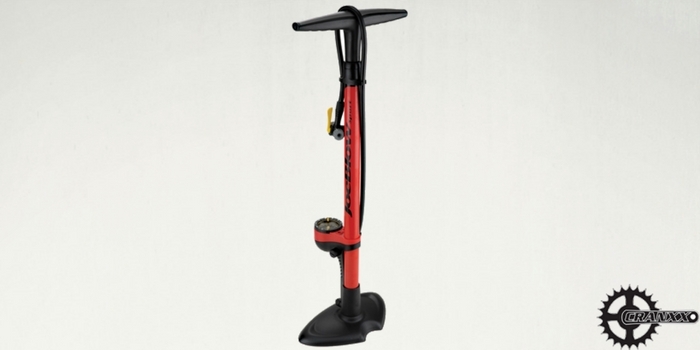 The Joe Blow II is one of the best selling floor pumps in all of the online stores where we shop. It is known for being durable and consistent. The handle is padded and ergonomic so that your hands don’t get tired when you’re pumping. It also features Topeak’s TwinHead™ technology which inflates both Presta and Schrader stems with ease. All you have to do is flip it over to switch. The pump also has a wider-than-normal base which makes it incredibly stable when pumping. 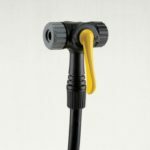 With an extra long hose 360° pivot that makes it easy to access those hard-to-reach valves (like on a kid’s bike) is just plain easy to use. The gauge is probably one of the most prominant and helpful features of this pump. It’s elevated toward the top of the pump tube so it’s easy-to-read and it’s based off of the look of a chronograph with both PSI and Bar indexes. When pumping anything it’s important to know the pressure and the JoeBlow makes this a no-brainer. Finally, the pump comes with ball and air bladder needles and a Dunlop valve adapter so you can use it on more than just bikes. All accessories fit neatly (and easily) in their own holders on the pump so they’re always handy. It’s just over 26″ tall and the base/handle are 9.8″ at the widest. The pump is 3.09lbs. When we set out to test any bike pump we line up a stable of bikes which consist of just about every type of bike and a variety of sports balls to test the needles (if they have them). We deflated and inflated both tires on a road bike (presta), a mountain bike (presta), a hybrid (26″ wheels, schrader), 2 kids bikes (20″ wheels, schrader), a soccer ball, a football and a yoga ball just to round it out – pun totally intended! Doing this type of test with back-to-back pumping really gives us a feel for how easy a pump is to use, how it feels if you have to pump a few tires in a row and it’s stability and durability. If the pump has a gauge we pump to a specified pressure, release the pump then check the tire’s pressure with our favorite stand-alone gauge to see how accurate the gauge is. 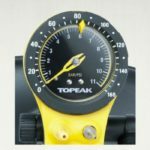 Topeak is known for producing items that really stand up to the junk we throw at them as cyclists. My pumps normally get tossed around in my truck, kicked around in the garage, loaned out to neighbors and used by my kids. If a pump can handle that kind of abuse and still pump accurately and quickly then that’s what I want. We wanted to get a feel for what would be the most common version of this pump so we picked up two of them, one from Amazon which was the standard Topeak bright yellow and the exclusive red one from Performance Bike which, at the time of this review, was on sale (see link below). Both pumps are identical except for the color so we’re going to talk about them as a single item from here on out. 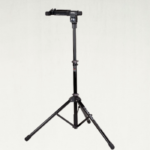 We noticed that the JoeBlow Sport II is always ranked in the top 10 on Amazon in sales (at the time of this writing it was ranked as the 6th most popular in the Bike Pumps) and while that isn’t a complete indicator it sure helps establish its value. So, with that in mind and two awesome packages shipped to us within just a few days, we were ready to test them out. 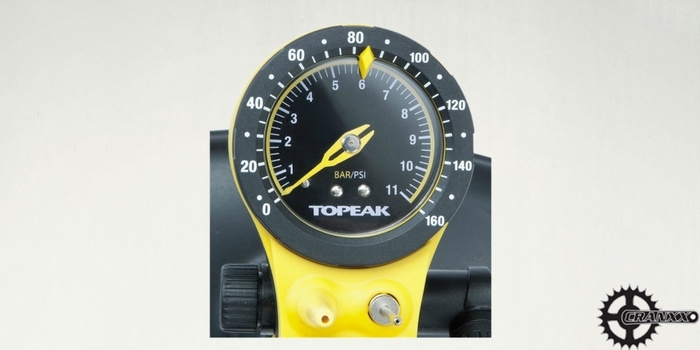 Topeak nailed the design of this pump. The handles are large, wide, ergonomic and, dare we say, comfortable even after repeated pumping. I didn’t get any hand cramps like I have with some of the big box floor pumps I’ve used in the past. One of the most prominent and useful features of this pump is the gauge. They put it on the front of the main tube at the base so it would be easy to see. It’s also really easy to read the pressure because of how it’s laid out. Speaking of the gauge, it’s pretty accurate and any difference could probably be attributed to the small leakage that comes from engaging and disengaging. However, we did notice that the index (the little pointer on the gauge that allows you to mark the pressure you want) seemed to loosen quickly during the testing period. That makes it tough to get it to stay in the same place over time which is a negative. Speaking of negatives, the biggest issue with this pump is the TwinHead. It’s literally just BIG. The concept is great in that you don’t have to unscrew anything to switch between types, you just flip it over. When it works it was great however it didn’t work everytime. It was hard to get it to engage properly without much leakage – especially on the kid’s bikes. It seemed like the Schrader side was more finicky than the Presta but we had issues crop up with both. It wasn’t every time and it was certainly more of an issue with the smaller spaces on a 26″ or under tire. Keep it mind that it wasn’t a lot of leakage, but enough to take notice and be frustrating to hear the hiss of all your hard work going to waste. While I only had a weekend with the Topeak JoeBlow™ Sport II it’s one that I would consider keeping in the long term to see how well it holds up over time (if I do you will see a long-term update). 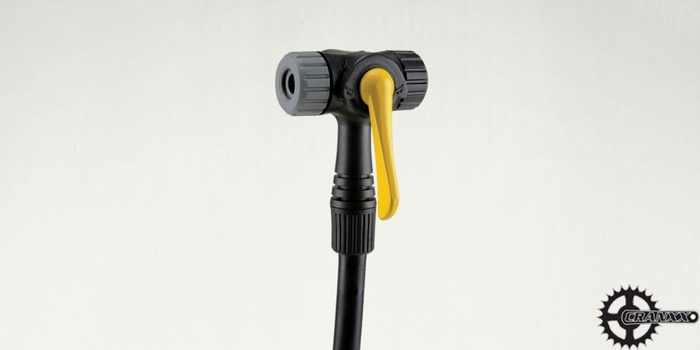 One complaint we read in the 2000+ reviews out there for this pump is that the hose isn’t durable and can crack after a few months – we would be interested to see if that was the case. Overall the pump does it’s job as an “all arounder” but it’s not the best out there. Rating: We’ve given the Joe Blow Sport II a 4 star rating. In our research we only found a few people who didn’t like this pump and usually their biggest complaint had to do with the size of the head, the difficulty they had trying to seat it and the quality of the hose. We would have to agree with their assessments. We just messed with it for a weekend and found that it didn’t give us a consistent air-tight seal nor did it make the switch as quickly as it promised. But when it did it pumped super fast and without any extra effort above 100 psi. Here’s the bottom line:All cyclists know they will eventually need a pump if they want to keep riding. If you ride a bike, have balls or your kids have bikes then you will want this pump. It’s easy to use can do the job for the long term – with some people saying they’ve had theirs for over 8 years! But if you have smaller bikes, or smaller hands, you may want to stay away. 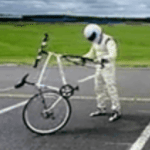 Anyone who has multiple bikes or pneumatic tires that are small. If you need to switch between Presta and Schrader frequently then the size of the head might become an issue. 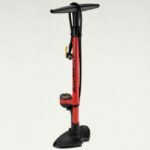 This is a summary review for the Joe Blow Sport II, if you want to read about the best Floor Pumps, then you need to check out our Best Bike Pumps Review.